Trump supporters are mad, generally. Social media suggests they’re fundamentally unhappy people. And today they’re directed their misplaced rage at overpriced coffee giant Starbucks in the stupidest way possible. The Trump army’s ire started brewing back on November 7th, after a video surfaced depicting a Starbucks patron demanding to have the name “Trump” written on his cup of joe. The barista, who identifies himself as Ryan, tries his best to ignore the unruly customer while one of his coworkers phones the cops. Unfortunately, this is not the first tantrum thrown by a Trump supporter in a Starbucks store. Backlash began after Twitter user Baked Alaska—a vocal Trump supporter and creator of the predictably racist Build The Wall app—got a hashtag and accompanying instructions recently started trending among his ideological peers. 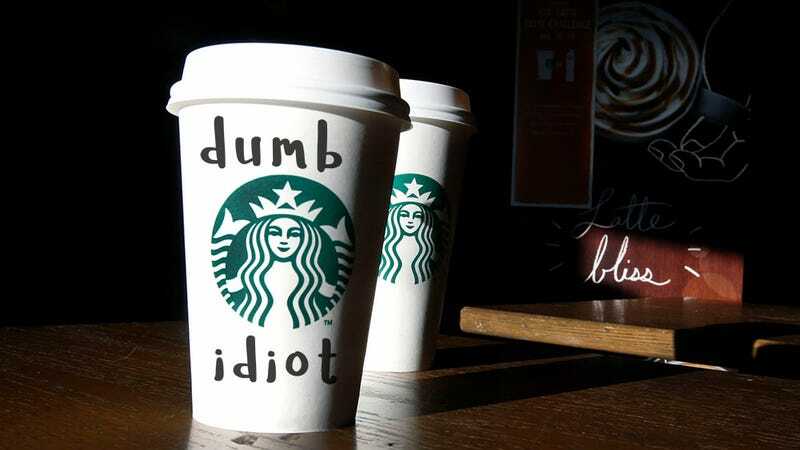 Exactly what filming Starbucks employees who refuse to write “Trump” on a paper cup is supposed to accomplish is beyond my powers of reasoning. And seemingly, it’s one of the things Trump supporters and I can agree on. But here comes the ironic part. Businesses whose CEOs had been against, were still concerned about, or who had seemingly even mentioned Trump as anything less than a glowing beacon of freedom were compiled with the intention of having their products boycotted by Trump supporters earlier this week. Among them? Starbucks. Repeatedly patronizing a business you propose to boycott is the definition of counter-productive. It also serves as a keyhole glimpse of the hellish stupidity that this country will be forced to take at face value for the next four years. Over the years, writing customer names on cups and calling out their names has been a fun ritual in our stores. Rarely has it been abused or taken advantage of. We hope and trust that our customers will continue to honor that tradition. We don’t require our partners to write or call out names. Well, it took less than a week for the boycotts to fall apart, baristas aren’t compelled to write or say anything, and Starbucks is laughing all the way to bank.